It’s a book that Piers Morgan describes as ‘absolutely hilarious’, which should serve as a massive red flag. And certainly the first book from Titania McGrath – by her own estimation the most ‘woke’ person on Twitter – does nothing to ease divided Britain, playing firmly into the hands of those who think the liberal left are nothing but dictatorial thought-police for whom all reason goes out the window in their ceaseless, self-aggrandising quest to right perceived social injustices. As you may well be aware – given the widespread publicity since ‘she’ was conclusively outed by Chortle earlier this month – McGrath is actually the comedian Andrew Doyle, already a seasoned baiter of progressives through his work co-writing the splenetic TV reporter character of Jonathan Pie. Blissfully unaware of her own privilege – and condescension – McGrath is obsessed with such hot topics as cultural appropriation, intersectional feminism and identity politics; her avowed aim to smash the patriarchy, the capitalist hierarchy and the very notion of gender. And her weapon, apart from Twitter? Feminist poetry. There are some examples in the book, proving her very much a William McGonagall of our times. In an interview, she has said: ‘Any male who attempts to review my book will be committing a form of sexual assault’. But here goes nothing. McGrath is clearly an absurd extension of aggressive liberalism with her credo that ‘ my feelings don’t care about your facts’ – a direct reversal of outspoken conservative broadcaster Ben Shapiro’s take on the increasingly polarised left-right debate. For what are facts but a form of oppressive colonialism against your gut feeling? Slight problem is that last one is actually a real, unironic quote from feminist scholar Sheila Jeffreys. Doyle includes plenty such examples in Woke to show he’s not exaggerating by much, even if he’s picking his examples from a lunatic fringe. McGrath, like any tyrant, has unshakable conviction that what she is doing is right. If anyone doesn’t agree with her – even if they are from a minority she claims to be championing – they are merely exhibiting self-hatred and must be saved from themselves. Superficially what Doyle is doing isn’t new. Readers with long memories might remember a spate of supposedly humorous books, of varying quality, in the 1980s, when the term political correctness was first coined. Those authors would endlessly make jokes along the lines that we would never be able to say someone was old any more, but ‘chronologically challenged’, even if three decades on that diktat never quite got enacted. Doyle is smarter, and funnier, than this with one-liners are – at least for the most part – more subtly satirical and knowingly ironic, and can certainly liven up a Twitter feed full of virtue signals. But what’s funny in tweets can get grinding over the length of a book, even one as concise as this, and the nagging whisper that gags at the expense of the more extreme utterances of the left are actually promoting a more unpleasant agenda of the reactionary right starts getting louder. Basically, the tone becomes a bit Rod Liddle the more you read it. However the first sign of a despot is no sense of humour (see Trump, Donald), so even the most achingly woke should appreciate the wit in the way Doyle skewers some of the more outlandish suggestions from their side. And it does no harm to see yourselves as others do, and perhaps understand the resistance from unprogressive diehards, when good intentions become as dogmatically unhinged from most people’s reality as the viewpoints Doyle is mercilessly mocking. 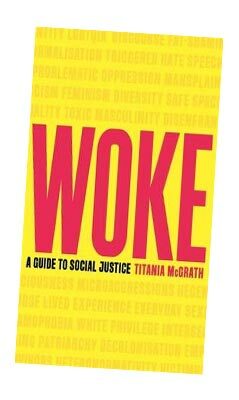 • Woke: A Guide to Social Justice by Titiana McGrath is available from Amazon priced £9.23 and all good progressive feminist vegan bookshops.